Pineapple is a healthy tropical fruits and tastes good anyhow you consume it. Pineapple Drink is one way to enjoy this juicy fruit. Pineapple is a king of tropical fruits. Despite of it’s yummy taste, there are many health benefits of pineapple juice. Pineapple juice for coughs: It is found in a study that Pineapple is actually 5 times more effective at controlling a cough than any cough syrups.Pineapples contain vitamin C, manganese, and bromelain, an enzyme for fighting inflammation. A cup of Pineapple juice contains Vitamin C , which is half of the recommended daily amount and vitamin C is important for strong immune system and fighting any infections. The bromelain acts as an anti-inflammatory that can soothe irritated airways. There are additional benefits of pineapple juice which include: sore throat relief, arthritis and injury pain management. But before buying store bought juice, think twice because they have loaded sugar, preservatives and artificial flavors in them. So, why to buy those drinks when you can prepare at home. I have added sabja seeds( Sweet Basil) which helps in digestion, controlling body heat and is also good for skin. You can omit Sabja if you wamt, but I love them lingering on tongue, when I sip any juice. 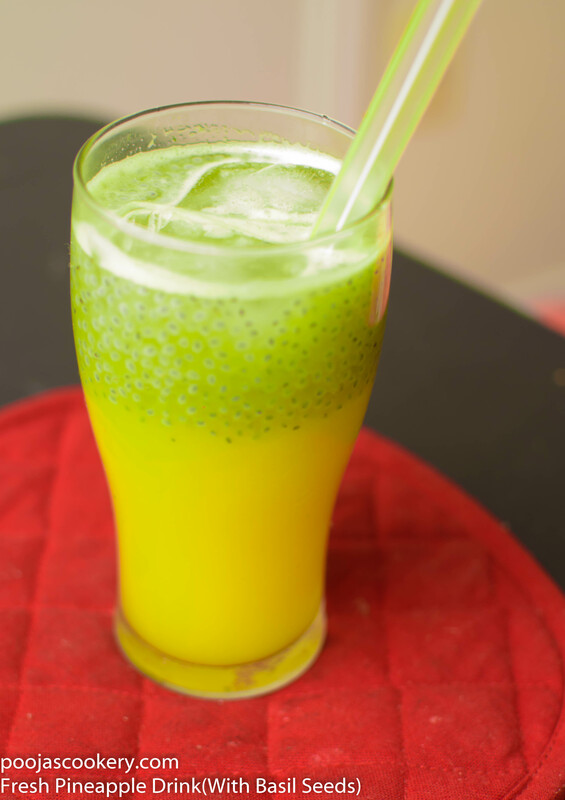 So let us prepare this amazing healthy pineapple drink . Wash sabja seeds well and soak them in 1/2 cup water in a bowl for 15 minutes. They will soak water and bulge double in size. Remove the peel of pineapple and make big cubes of it. Blend the pineapple pieces along with 2 1/2 cups water in a blender. You can add 2 tablespoons of sugar if you like but I don’t like any added sugar in my fruits, so skipped it. Strain the juice using strainer and pour it in tall glasses. 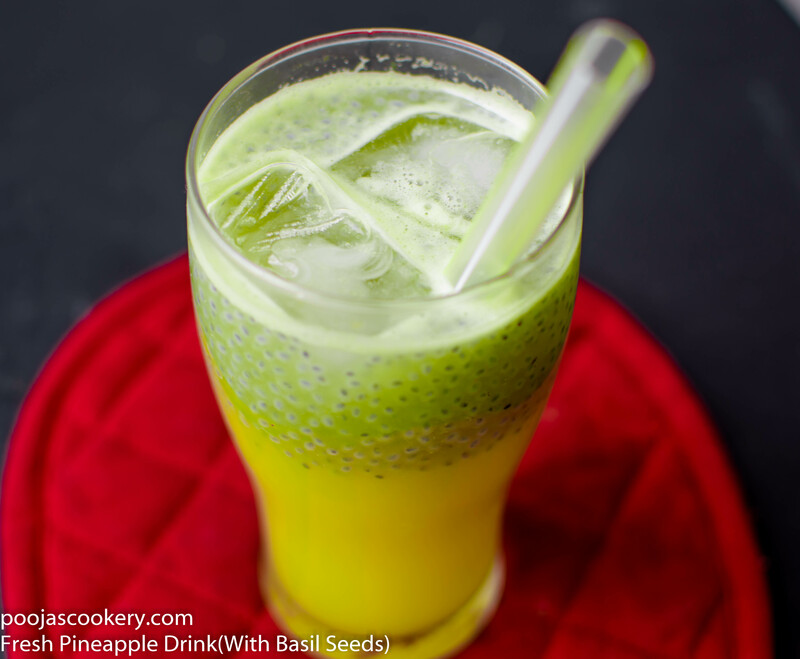 Add 1 tablespoon bulged sabja seeds in each glass . Drop in some ice-cubes and serve it immediately. You can add 2 tablespoons of sugar if you like but I don't like any added sugar in my fruits, so skipped it.